Home > Ask Our Experts > How Can I Get Help to Stay Off Drugs? I am in year 9 and 15 years old. I have been smoking marijuana for the last 5 months, about 5 times a week. I want to get some help but I am scared to tell my parents and I don't want them to know about my addiction. What can I do to stop myself smoking pot and cigarettes? Many people are not aware that marijuana, or cannabis, addiction is a serious problem. Much fuss is made about the physically addictive properties of the “harder” drugs, such as heroin, but it is just as easy to become psychologically dependent on drugs such as marijuana. And while it is practically impossible to overdose on marijuana, a dependency can lead people to withdraw from their social life and families, and have a debilitating effect on their work or school life. 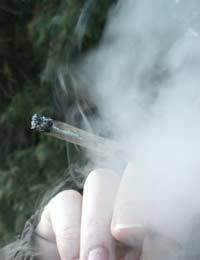 Marijuana use can also cause serious, long-term damage to the user's physical and psychological health. But the good news is, you've already taken the first step towards kicking the habit: Recognising you have a problem. Many young people don't address their drug taking as a problem until much later, when it can be far more difficult to deal with. Ingrained habits are generally harder to quit than new ones. How serious do you consider your marijuana smoking? You may be able to quit without help – but it will be necessary to stop hanging out with the friends who also smoke. Peer pressure is a big factor in preventing people from quitting a habit – from illegal drugs, to alcohol and cigarettes. Think hard about whether such friendships are really worth the damage that drugs will do to you. Beyond that, if you think you need further help with a drugs problem, perhaps the best place to start is your local GP. Your GP is well placed to recommend a course of action, and will be knowledgeable about the treatment centres in your area. However, you may be concerned about privacy. As a general rule, GPs are expected to keep patient information confidential. Even if you are under 16, and older than 11, your GP shouldn't inform your parents of your marijuana habit. Having said this though, there is still no actual law preventing a GP from telling your family about your treatment. If you don't feel able to talk to your GP, it may be possible to go directly to a drugs treatment service in your area. In Britain, your local Drug Action Team (DAT) will be able to provide you with the information you need. Just type your general location and "Drug Action Team" into a search engine, and your local DAT website should appear. You can also try the national drugs helpline, “FRANK”, on 0800 77 66 00. The next stage may involve assigning you with a “keyworker”. This is a trained professional with whom you will have one-to-one sessions to help you to quit your habit. Expect the period of treatment to last at least three months. Just as importantly, though, it sounds like you have a good level of common sense and self-awareness. This will help you to manage your marijuana habit to the stage where you'll be able to give it up for good.